A recent update to the Google Search app for Android added enhanced support for the "OK Google" hotword. 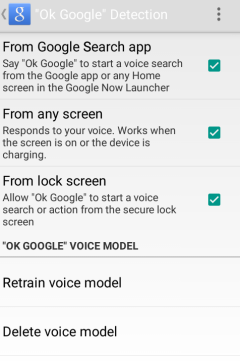 If you go to the settings, tap "Voice", then "OK Google Detection", you can enable "from any screen" and "from lock screen". 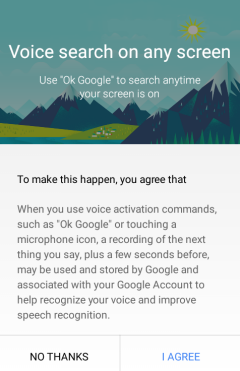 This way, you can say "OK Google" to start a voice search or action when the screen is on or the device is charging and even from the lock screen. Right now, this feature is limited to English/US and requires Android KitKat. 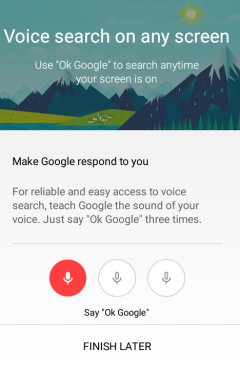 When you enable these features, Google asks you to say "OK Google" 3 times to train the speech recognition software and it also enables Audio History. "When you use voice activation commands such as 'OK Google' or touching a microphone icon, a recording of the next thing you say, plus a few seconds before, may be used and stored by Google and associated with your Google Account to help recognize your voice and improve speech recognition." 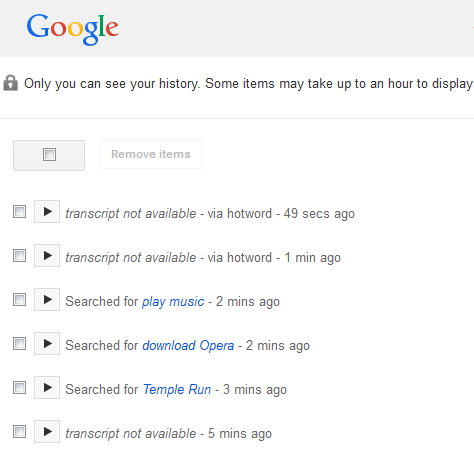 Your recordings are available online at the Google Audio History page. "Only you can see your history. Some items may take up to an hour to display," informs Google. You can delete the recordings, play them or click the Google search links. Click the "gear" drop-down menu, click "delete" and you can pick from "past hour", "past day", "past week", "last 4 weeks", "the beginning of time" (the same options that are used by Chrome's "clear browsing data" feature). 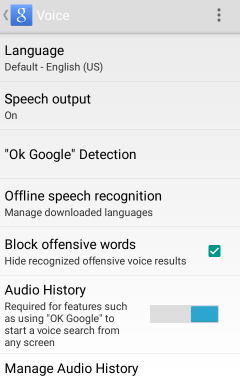 You can disable Google Audio History from the Android app's settings, but this also disables "OK Google" detection from any screen or from the lock screen. "When Audio History is off, voice searches will be stored using anonymous identifiers and won't be saved to your Audio History, even if you're signed in to your Google Account," informs Google. "Google uses your Audio History to: learn the sound of your voice, learn how you pronounce words and phrases, recognize when you say 'Ok Google' and improve speech recognition across Google products that use your voice." The new Audio History feature seems to replace Personalized Voice Recognition, an opt-in setting added back in 2010. "If you opt into personalized recognition, we begin to associate the recordings of the words that you ask us to recognize with your Google account. We then automatically use these words to build a speech model specifically for you. This speech model enables us to deliver greater recognition accuracy," explained Google back then. While it makes sense for Google to improve the voice search history and build personalized voice models, I can't find any connection between the improved "OK Google" detection, which works offline, and the Audio History online service. It's probably an artificial requirement, just like the Google Now feature, which requires enabling location services in iOS, but not when using Android.